This text was written in 2002 by Hansi himself for the February issue of Metal Hammer magazine which is why Thomen is still counted in the line-up at that time. "It was in 1984 when André and I met for the first time on the commercial college in Krefeld / Germany. We noticed fastly that we shared the same interests like for example our common passion for Heavy Metal and that we - at least in a unspectacular way - played music in our combos: I played rhythmn-guitar in my band named Executor and André used to play guitar in his band. However, André's group - named European - acted more professional than mine did, and that's why you could call them the true pre-version of Blind Guardian. After a while they changed their name from European into Zero Fault. During that time André wasn't much satisfied with the frontman of his band because this guy wasn't able to fit to the band vocalwise or in other words: he really disliked his kind of singing. During a vacation time with the whole school class André learned to estimate my talent, which he had seen in my incredible screaming and shouting. Due to the fact that my dream and ambition has always been to become a professionell musician as fast as possible, I didn't hesitate long and finally joined Zero Fault. We both convinced the other two guys of the band that we - due to the new line-up - better should change the band's name again. We came to the conclusion that the new name should be Lucifer's Heritage. At this time I made the acquaintance with a guitar pupil of André: Thomen. Unfortunately he was only remarkable for his lack of talent. Then one day the coincidence happened and it was something totally unexpected for all of us: All of a sudden Thomen sat behind the drum-set in the rehearsing cellar in Olbrich's house and he played some really good rhythmns! We think he hits pots since his earliest childhood but never mentioned it. After that incredible session it was André's suggestion to let Thomen learn playing the drums instead of guitar and Thomen followed this advice but. Though he did that in another band. However, the contact to André who was for Thomen something like a Godfather never ended: While André was spending some time with his girlfriend Thomen waited for him at the housedoor and everytime when I met André for some rehearsals I saw those cigarette ends on the ground and was sure: Yes, Thomen is already there... how cute. 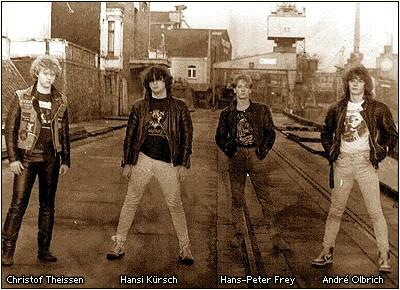 Someday André told Thomen, that his band had a new frontman who sounds similar to Paul Di'Anno. Thomen as a big Di'Anno fan was impressed and curious. Somewhat later we losed our drummer and so Thomen was our first replacement choice. With this line-up we recorded our first demo, named "Symphonies Of Doom". For this project everyone agreed to save 400 DM (German currency) - which was a lot of money in the early Eighties - so we collected the money, put it into a pot and so we would have been able to finance the recordings by ourselves... if Thomen hadn't squandered the money before our studio date. Now we stood there with empty pockets again and had a big problem to reorganize the badly needed 1.600 DM to do the payment. Thomen wasn't able to ask his father if he could make him a presentation payment for that money due to his father's big hatred towards our band. The reason for his hatred was that his father thouhgt we would hold his son back from becoming a roofer but Thomen never thought about taking over the family-firm someday. Because of those reasons he didn't give him the money and today I'm able to understand his perception... Thomen couldn't apply the money thus he had to leave the band again. A few days later our financial crisis became more and more relaxed: André's grandmother was able to give us some money - and I got a time job to receive some extra money - as we had the money we needed, it was the bands decision to welcome Thomen back into our fold. Then we recorded our demo and the criticisms were quite positive. Well, on this five track record there wasn't a song that could be predicted to become one of our favourites years later. Only one number with the title "Helloween" was good enough - with a different arrangement and title ("Wizard's Crown") - to find a place on our debut album ""Battalions Of Fear". After that session Thomen left the band again - we can't say why today... for unknown reasons - and was replaced by our former drummer Hans-Peter Frey. Then in the mid of 1986 a really creative time began during that we recorded our second "Helloween"- and Melodic/Speed/Power-Metal affected demo - "Battalions Of Fear". With "Majesty" - that became later the opener of our debut - we manufactured the first cross reference to J.R.R. Tolkien works. We also made the decision that our second guitarist Markus Dörk wasn't longer useful for the band and searched a replacement for him. His substitute Christof Theissen sounded too much trashy so his membership didn't last long. Suddenly we noticed that my vocals wouldn't be good enough anymore. We had an idea and called up a singer's casting. Many strange guys knocked on our door and after that we all were very convinced that my voice would be still the best compared to those which my applicants had. Since then my position as the band's singer never was in query again. The remainder is history: With this line-up we recorded our debut album "Battalions Of Fear" but renamed us during the records because we noticed that everyone who bought our demo on the disc stock exchange put us into the Black-Metal corner and that wasn't intended by us. The reason for that was our name Lucifer's Heritage which didn't fit really to our music style. So we gathered in our studio and made a list with our favourite name suggestions. For some days we were named - in addition to the Metallica song - Battery but our friends mentioned that it wouldn't be such a good idea. We took another suggestion Raging Waters - in this case in addition to the famous Testament song - but in the end we selected my suggestion..."